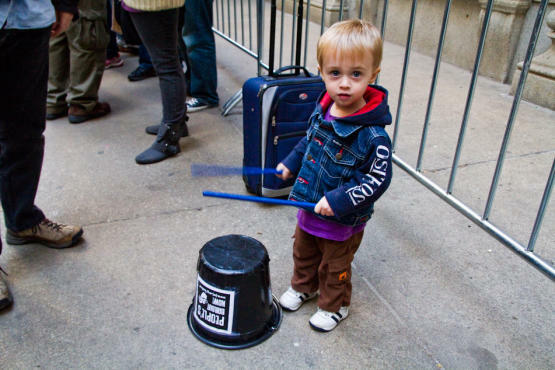 Despite having its drums hauled away at one point, Occupy Chicago bounced back this past weekend and went multi-generational with a family gathering and sign-painting on Saturday. Monday, the Jane Adams Senior Caucus joined in a march with Occupy Chicago against Medicare and Social Security cuts. More than a thousand marched. And 47 seniors were arrested at a sit-in, including 3 in wheelchairs, according to Occupy. Occupy protesters also gave their own intro to a speech from Wisconsin Gov. Scott Walker at the Union League Club last Thursday. Today, Occupy Chicago is pushing for citizens to call in support of HR0610, proposed by State Rep. La Shawn K. Ford to recognize the protesters free speech rights among other things. There's also an Occupy El Barrio in Pilsen at 5:30pm today.